Last evening Dog and I walked in the woods, accompanied by the occasional sound of thunder far to the north, at the very edge of my hearing. The evening was warm and thick with humidity ahead of the storm. For Dog, the moist air meant his already sharp sense of smell was even further heightened, and his behavior suffered. He moved around so much I couldn’t get an "action" photo that was in focus. So finally I gave up and asked him to sit. As you can see, he complied but he’s not paying any attention to me while he’s doing it. His nose is in the air, smelling all those wonderful storm-enhanced smells. For once, we didn’t see any deer (or perhaps I should say I didn’t see any deer); Dog thought he saw things everywhere. Dog was like a mad scientist working at fever pitch. He ran from side to side, nose into and under everything. Truly, you would have thought the dog hadn’t been out of the cabin for weeks, even though he’d had a good morning walk and run. Later in the evening, the storm rumbled nearer, but never quite arrived at the cabin in full force. But this morning, I am reaping its benefits—lower humidity and slightly cooler weather. This morning, I can smell fall in the air, a blessed relief. Crows are about the only bird that Dog and I see on our morning walks anymore. That’s because crows are feel their job is to awaken early and report back to the rest of the forest on anything that’s changed since dusk. They take their job very seriously, and there’s always some crime or change that needs to be broadcast to the rest of the forest. These two were very suspicious of Dog and me. You can just see their displeasure. August is not a good month for birding at the cabin. January and February are the only other months where I see fewer species of birds. This August I saw exactly the same number of species (34) that I did in 2006. Okay, so there’s a slight chance I might see a new species tonight or tomorrow before the month ends, but I’m not banking on it. Some of the summer residents are still in residence. I saw one of the local pewees out of the forest and sitting on a wire at the bottom of my lane last night. This bird was singing outside of its summer breeding territory, if only by some yards. As pewees are nearly found inside the forest canopy, I had to wonder if this one’s unusual singing location was somehow a precursor of its trip south, as though it was checking with the other local pewees to see if it was time to pack the bags yet. Or perhaps once breeding is over, pewee territories simply don’t matter anymore. I don’t know the answer. Swallows are in short supply, and I think the kingbirds have left the mountain already. I’m starting to think the towhees are gone or going, too, as it’s now been three days since I’ve heard them call or sing. I have heard them every day since their arrival in April, and three days of silence is unprecedented. Note: I am going to participate in the first International Rock-Flipping Day on September 2, though my results aren't going to be posted until the next day. IR-FD was thought up by Dave Bonta of Via Negativa. The idea is to flip over one or more rocks on September 2 and draw, photograph and/or write about what you find underneath. Please remember to replace your rocks and return them to their natural state when you are done. If you’re a birder and if you’ve lived in the same spot for 15 years, as I am and as I have, new species of birds for the yard list don’t pop up every day. Part of the reason I enjoy spring and fall migration so much is that it offers the possibility, however slight, of seeing a bird species that I haven’t seen at Roundtop before. So it comes as an especially big surprise when a non-migratory new species of bird shows up—namely, the Northern Bobwhite seen in today’s photo. The days are darkening in the evenings now as surely as they already have in the mornings. When I headed out for my walk last evening, I found it was closer to sunset than I expected and was annoyed with myself for not starting out 15 or 20 minutes earlier. 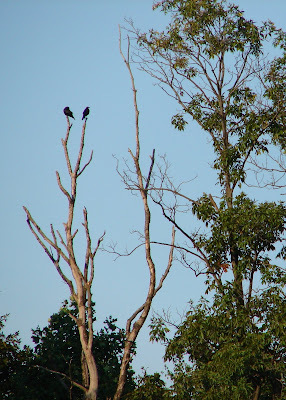 Already, I couldn’t see well enough to ID the smaller and more nondescript birds high up in the trees. They were already little more than silhouettes to my unaided eye. Because I was rapidly losing the light, I changed my walking plan and decided to stay in open areas and not head into the woods. I ended up over by Roundtop’s Minuteman slope and saw several birds sitting on the split rail fence, none of which I could immediately ID because I wasn’t yet close enough. I kept walking and the birds gradually flew—a robin, a bluebird, a starling. One bird remained on the fence, and it was starting to look a bit different, but I wasn’t close enough to tell what it was. I got closer, and the bird still didn’t flush. The bird was facing away from me, so I could only see its back. I don’t remember the moment when I started to think "bobwhite," but by the time the bird turned to check me out and I saw its face pattern, I was no longer surprised. I wasn’t yet close enough for a photo, but even as I walked closer, I was already telling myself this must be a released bird (and so uncountable). When I was a kid, the Pa. Game Commission routinely stocked bobwhite quail for hunting. I saw them a lot in the warmer months and in the fall. But even if the birds survived hunting season, they didn’t survive our winters. Eventually the Game Commission stopped stocking the birds. Hunters were upset and many local gun clubs took to raising their own quail for release. Eventually, most of them stopped too, because this time the Game Commission was right. The birds couldn’t survive the winters, and keeping the fields stocked with them was an endless and expensive task. But having a bobwhite on the fence in front of me, released or not, was still cause for a photo, so I kept inching forward to get into range. I tried whistling the bobwhite call that my grandmother patiently taught me, all those years ago, hoping that the bird would remain on the fence long enough to for me to get close enough for a photo. And then I saw them. Three more quail, young ones, pecked the ground underneath the feet of the quail on the fence. These young birds were full size, but their plumage didn’t yet show the stripes of an adult bird. A moment later and I heard the soft sound, almost a coo, that the birds make amongst themselves. A female stepped out of the grass. Suddenly, the situation was a different one than what I thought. Here was papa bobwhite on the fence, protectively guarding his brood. Mama was down on the ground with the kids. If these were released birds, they were released as a family, which seems unlikely. It seems more reasonable that the adult birds, released or not, bred in the wild and the young ones were born here. I managed to get the photo, though not one of the all the birds together. After a while, papa flew off the fence, and the adults herded the kids and headed up the slope. These birds may still not survive the winter. I suspect they are holed up in the rocks that line the western edge of Minuteman. Come winter, the slope will have 4 feet of snow on it (presumably), and the birds won’t be able to forage much of anyplace without dodging skiers and snowboarders. Perhaps they will simply leave then and go someplace else. I hope so. Could these birds really be wild quail? Is their presence yet another sign that southern birds, in the face of global warming, are ranging further north? I honestly have no idea. 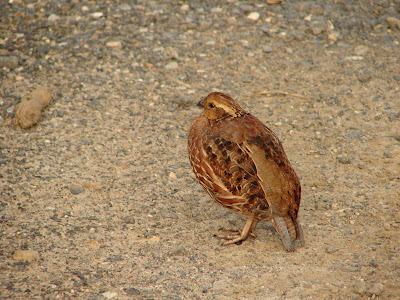 I only know that last evening, in the minutes before dark, I saw five bobwhite and got a photo of one of them. For the moment, that’s enough. Last night was a good night for moths. I always leave my porch light on until I go to bed, and when I run the dogs for the last time, I always check to see what's floating around the light. That's when I found this lovely fellow. The moth was a good-sized one, over 2 inches. 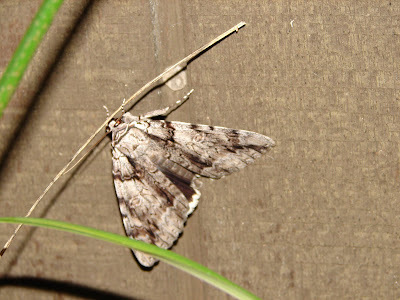 I think it's a Hermit Sphinx Moth, and if not, then it's some other kind of sphinx moth. I'm still doing research--so many moths, so little time, so many references to check. Part of the reason the ID is a bit ambiguous so far is that the hawk's wings are folded, so I can't see much of the underwing, except that it appears to be dark brown and edged with white. There's a lot of sphinx moths on this continent, and all of them are pretty large, which for me is part of their appeal. Many of them are also a lot more colorful than this moth, often with round "eyes" on the wings, pinkish colors and very well defined and dark stripes. Still, I've never met a large moth I didn't like, and if this one is a hermit sphinx moth, it's an uncommon to rare one in my region, which makes up for his lack of visual drama. This morning Dog and I (well, me) saw the lunar eclipse. For some reason, I thought it would be over by the time I got up, so I was thrilled that it wasn't. The moon was setting when we saw it and not far above the horizon. Eclipse moons are reddish and so are also called "blood moons." Until you've seen the moon like this, you don't realize how much the sun creates a glare on the surface of our moon. When the moon is un-illuminated by the sun, more craters are visible and the moon looks close enough to be in the next county, not 240-some thousand miles away. For once the sky was clear, and the viewing was excellent. What a dramatic way to begin the day! Some great photos of the eclipse have been posted at www.spaceweather.com so you might want to check those out. Finally! The gloom and fog of the previous nine days has gone, kicked out Saturday night by a strong storm. And now, it’s suddenly September. Oh, I know the calendar won’t agree with me for another six days, but it now feels like September. This morning the sky is crystal clear, the humidity low, and the temperatures lower. It feels wonderful. It is also dark. When Dog and I started our morning walk today, the eastern sky was dark. Orion was even visible in the eastern sky. This was the first day this season I’ve been able to see the morning version of Orion. The Great Hunter won’t be an evening constellation for another few months, but he has been prowling the early morning sky for some time now. I’m just not awake then to see him. The darkness shouldn’t be a surprise, but after nine days of no visible sunrises at all, the difference from before is a jolt. Before the fog and rain arrived, I could see a tinge of color in the east, and the sky overhead was steel blue and already too light for stars. Now, only the east has a hint of steel blue, and the first orange of sunrise is still nearly an hour away. Another outcome of the better weather is that the robins and starlings have returned to the mountain top. Where they disappeared to during the rain and fog, I have no idea. Certainly the weather off the mountain was no better than on the mountain. And worms for the robins are just as prevalent in the mountain’s mud than the valley’s. But they had disappeared and now they’re back. Ditto the starlings. Baby Dog is still stopping at the same spot every morning to check (and hope) for a reappearance of the foxes. It has now been nearly four weeks since her original encounter, and her hope hasn’t dimmed. So I should not be surprised that when she found a toad this weekend, once her nose touched it she backed off like it was red hot. It’s been nearly a year since Baby Dog tried to eat the first toad she ever found. She foamed at the mouth for hours after that encounter, and judging by her reaction this weekend she hasn’t forgotten. Today's photo was taken yesterday, before the last of the clouds moved out. The fog had lifted, and the sky was already clearing, but not yet enough to see blue sky. 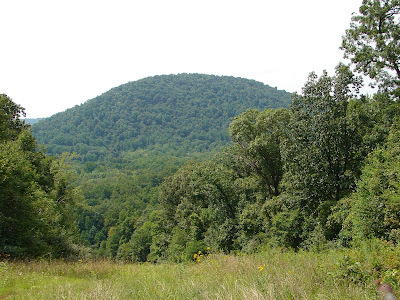 The view is of Neff's Hill, which some local folks also call Nell's Hill (old l's and f's often looked alike). More updated information on the bird deaths along the Susquehanna River is that the deaths are no longer limited to insect-eating birds. The latest reports are that ducks and shorebirds have also been found dead and floating in the river. Currently, the numbers are given as "dozens" of birds, but I've heard no new information on the cause of their deaths. Swallows have been found dead in large numbers along the Susquehanna River the past few days. Results are still preliminary (and reported to me about third hand) but the word is that they had no food in their stomachs and so likely starved to death. Toxicology tests are being run, however. 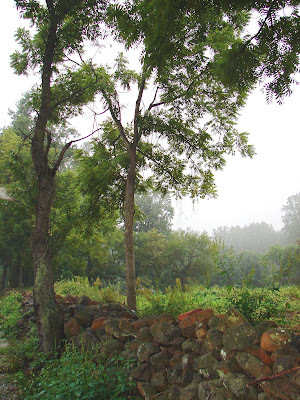 The weather here has been (as regular readers know), foggy and rainy and chilly since last Saturday. Apparently that has been long enough for the insects that the swallows feed on to disappear. Perhaps the scariest part of this story is that it was only a few weeks ago that I reported on an article in The Auk that indicated large numbers of insect-eating swallows and warblers died during their northbound migration in the late frost that killed the insects they feed on. And now it appears the same thing has happened during the southbound migration, though at this point I have no idea if the deaths are as widespread as what was the case in the spring. Why this may mean to the population of insect-eating birds as a whole is unknown. How long it will take the population to recover is also unknown. My photo today isn’t of swallows, but the theme of disappearances continues. This lovely old stone fence has been here for 150 years or more but may well not survive the week. 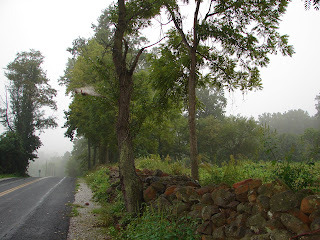 Road widening is underway, and another of these stone fences just a mile up the road has already gone. The lovely tree that I photographed along the outside of this same fence for my January 19, 2007 post has disappeared from the time I drove past after work yesterday to when I drove past this morning. Disappearances are just one half of the process of change--appearances of new things being the other half. I don’t think I would mind changes so much if so many of them weren’t for the worse. Mornings are now so dark that I can no longer take photos before I leave for work. So "today’s" photo was actually taken last evening. The scene is one I’ve photographed before. I enjoy taking the same photo in different months. My goal is to have a good photo of favorites scenes for each month of the year. We are all conditioned to think of the year as having four seasons, but even within the seasons, the scenes look different, though some more than others. A photograph taken in both June and August reminds me just how different the same scene will look in the "same" season. Even winter looks different from month to month, if only in the amount of snow that is or isn’t on the ground. So far, I could be doing better with this project. I have a really nice fall photo of this scene, and a decent spring one, so I still have a ways to go. If I ever happened to forget that the forest is now leaning towards fall, the birdlife around me reminds me. The pewees, towhees and kingbirds are still here, though none will be for much longer. I’m seeing goldfinch every day. But I haven’t heard a robin for a full week now, and it’s been weeks since the song of the wood thrush has brightened my evenings. Now I know that it’s too soon for the robins to head south, so where are they? I have no idea. Apparently they have found other accommodations. Perhaps they’ve simply wandered off the mountain and down into the surrounding fields. Starlings have also been in short supply this week, for no good reason that I can think of. Yet the bluebirds are here, and the mockingbirds, and the flickers. The owls are suddenly out and about again, and I can feel the year turning away from summer. Late summer is a time of disappearances. One by one, bird species disappear and the woods grow more silent. 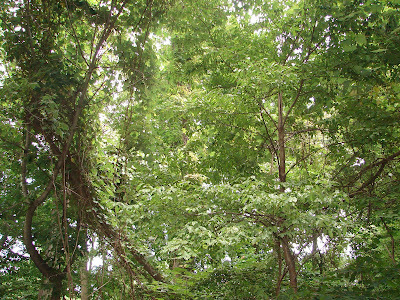 New growth in the forest has stopped, and the annual growth in the forest’s understory is starting to look withered, despite this week’s rain. Bird by bird, plant by plant, summer is ending. Last night I didn't sleep out on my deck. It wasn't the rain (see photo) that kept me inside, but the thunder and lightning with it. 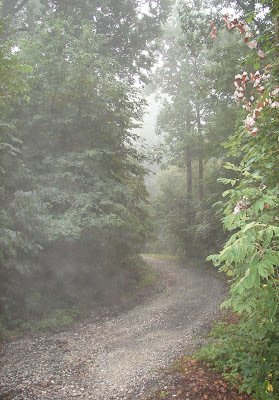 I have camped outside in thunderstorms many times, and my feelings during those storms have ranged from being uncomfortable to downright terrified. Dog is also particularly afraid during thunder, and Baby Dog barks at it--not a particularly good combination for camping out. So, since I had a nice, cozy cabin to head into, I did. The heavy rain and morning darkness now nearly forced me to resort to posting an archived photo. It's a heavy near-downpour that has brought aout 2" of much needed rain to the mountain. And it's still raining. Even with a rain jacket and rain hat, I got wet pretty quickly as I took the dogs for a shortened walk this morning. As my outdoor activity and even the activity I could see in the outdoors was limited by the weather last night and tonight, I'll take this time to report on my latest bird sightings. This weekend I was sitting out on the front deck when a hummingbird paid a visit, plopping into a twig on the fig tree while I was sitting under. That's one of the few hummers I 've seen this season. We shared a few moments of togetherness, just 4-5 feet apart, before the hummer resumed its errands. I can also report on two sandpipers I saw on the mountain. Anytime I see sandpipers on the mountain, it's a rarity. First and foremost is that mountains and sandpipers are not usually two words that are uttered in the same breath. Secondly, the snowmaking ponds that Roundtop has (and that occasionally attract sandpipers) are interconnected with pipes, and they are not usually allowed to get low enough for mud flats. However, this weekend the new pond was down about a foot or so, creating some minor mudflats and the occasional puddle. That was enough to attract two tired sandpipers on their southbound journey. I had one stilt sandpiper and one solitary sandpiper. Neither is a new species for my ongoing Roundtop list, which is now at 132 species, but the solitary sandpiper was only my second sighting in 15 years and the stilt sandpiper my third. Even though I live in a cabin in the woods, I’ve been feeling a bit cut off from the woods lately. Though all my windows are open, being inside the cabin is still being inside. I have missed the smell of the forest, of being a part of it on an intimate level. So I decided to move out into it. 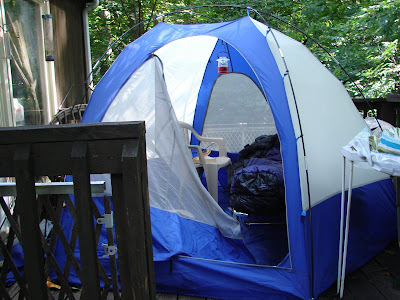 Today’s photo is my new bedroom in a car-camping tent that is now pitched onto my back deck. I have spent the nights out there in the company of two dogs, and in just a few days I am already starting to feel more attached to the forest again. One unexpected observation: my deck is smaller than I thought it was. I barely had room to pitch the tent on it, and the tent isn’t a huge one. Another observation: cicadas ARE louder than grunge rock music blaring from huge speakers on a stage down at the annual Purple Door festival at Roundtop this weekend. However, cicadas have the advantage of playing the same note over and over again, so it sounds like "white noise." Wait, that describes the grunge bands too, but the cicadas are easier to listen to. I can hear more, lots more, when I’m outside in the forest. One of the local foxes dropped by on Saturday night, yapping so close to the cabin and deck that it sounded as though it was right underneath me. I could also hear their much softer "bark" that followed the hoarse yap that is their more common vocalization. 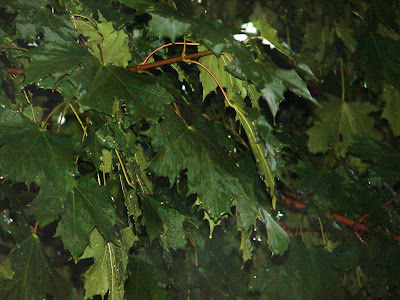 The screech owl paid a visit, too, and was very nearby. I heard the great horned owl, though that was further away. I avoided putting up the rain fly until the weather forced me into it. At night, it was wonderful to look up at the stars through the screen at the top of the tent. The next night, the clouds were already moving in and hid the stars from sight. Last night, it rained, though not heavily. I’m not sure I will stay out there in a downpour (or heavy wind). One advantage of deck camping is that I go back inside whenever I want. It's a fine morning here on the mountain. The weather is clear, the the temperatures moderate, the humidity low. It won't last long. Friday begins the annual weekend long Purple Door music festival. Roundtop becomes the site of thousands of kids wandering around and listening to about 40 mostly hard rock bands on three different stages. The equipment has already started to arrive, and the roadies will be hard at work tomorrow, and perhaps even later today. It makes for a very different kind of weekend, but it is kind of fun since it only happens once a year. The good news is that I can sit out on my deck and listen to live music. I also won't have to cook this weekend, as I can get street-fair quality food down at the festival. I probably don't have to explain what the bad news is, as I'm sure you can imagine that. 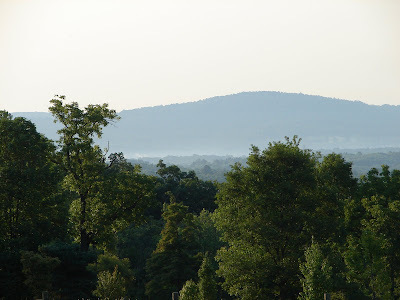 So for now, I am enjoying the peace and quiet of a lovely summer morning, staring at the purple mountain across the valley and listening to the sounds of birds throughout the forest. You know global warming is really kicking in when a day of temperatures in the "normal" range feels cool. That’s the case this morning. It was 65F when I got up, the normal low temperature for this day of the year, and it feels wonderful. I am now back to using a headlamp in the mornings when I take Dog for his walk. I don’t need it all the time. When I’m in the open, I can turn it off, but when I’m under the canopy of the trees, I need it for the first 10-15 minutes of our daily walks. The sun’s light is changing in other ways, too. The sunrise is further south along the eastern horizon than it was just a few weeks ago. In the mornings, I can still see stars when I first go outside. I take my daily photos as I’m heading to work, an hour or so after my morning walks, and I’m starting to notice that the light is pretty flat and dull. After this week, I am likely going to have to give up trying to take morning photos in the woods. I'll have to restrict my morning photos to things that are out in the open, where the light will still be good enough for perhaps another week or two. By the first of September I'll be taking my photos in the evenings for posting on the next day, so my photos will no longer be as current as they are in the summer. Little changes every day soon add up to big changes. In case I even try to forget that, the spinning of the year reminds me every day. Baby Dog is now at Day 13 since she’s seen the fox, and she still stops in that same spot every morning to look for it. Baby Dog is hyper aware of any change in her surroundings. I call her the town cop. If the neighbor parks four feet away from where he usually parks, she has to bark at the car because in her mind it’s not where it should be. She barks at the cats when she thinks they’re doing something they shouldn’t. Yesterday, I got a mail order of two books that came in a box. The cats always have to investigate a new box, but Baby Dog thought this was an infringement of the house rules and that they should be tattled on. She will be 2 years old in 5 days. With a little luck, the hottest days of the summer should now be past. I certainly hope so anyway. This past weekend graced the area with both lower temperatures and lower humidity, both a big relief to me. Around the mountain I’m starting to notice far fewer wildflowers than I saw just a week or so ago. 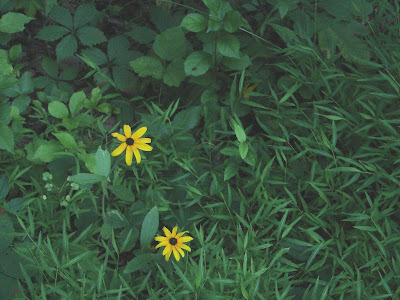 Many of the summer flowers are gone or at least past their peaks. 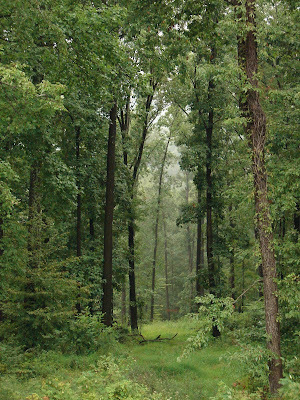 The forest has taken on that deep, almost dull green of late summer. With the passing of the hottest weather, the area’s hawkwatches are starting to get more active with the first fall migrants. The reports have risen from a handful of raptors each day to perhaps a few dozen birds on the day after a front passes. My meteor viewing this weekend did not go as planned, unfortunately. Saturday, the day before the peak viewing, was perfectly clear. I saw a few meteors early in the evening but felt tired and wasn’t out very late. Sunday was the peak of the Perseid shower, and the forecast was for another clear night. Unfortunately, as has happened so many times in recent years, the forecast was wrong. It was pretty cloudy and even sprinkled a bit, so I only saw one meteor before the overcast sky blocked all viewing. 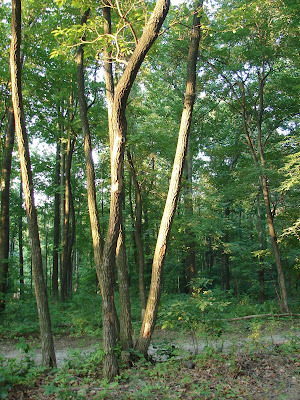 My photo today was taken this morning before sunlight had penetrated much into the forest. Already, the sunrise feels a lot later than just a few weeks ago. Sunrise is now about 40 minutes later than it was at solstice, at 6:17 a.m. Sunset now more than 30 minutes earlier than at solstice, now at 8:07 p.m., so currently I have well over a full hour less of daylight each day. And there’s still a long darkening road ahead. By winter solstice, another 41/2 hours or so of daylight will be lost. In this area, the difference from the longest day to the shortest is about 5/12 hours of daylight, split between later sunrises and earlier sunsets. At this rate, it won’t be long before I won’t be able to take photos in the morning before I leave for work. Fog was so dense up on the mountain this morning that I couldn't get a good photo. Sometimes fog can make a photo interesting, but this morning I didn't feel that that was the case. 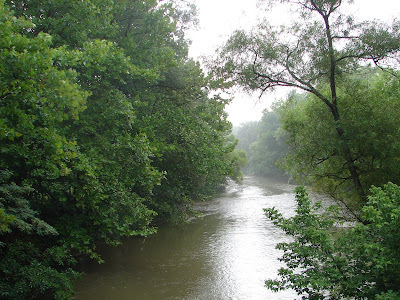 So I took this photo of the Yellow Breeches Creek down off the mountain where the fog wasn't so thick. The extreme heat of earlier in the week was herded out by several thunderstorms that came through yesterday and last evening. The temperatures are blessedly lower, but the storms didn't clear out the humidity. I guess I can't ask for everything! Still, the lower temperatures alone make me feel more human again. This morning as I stepped off the deck, I heard two great horned owls calling back and forth to each other. It's been a few months since I've heard them this close to the cabin. I half-hoped to see one or the other in the morning gloom, as the calls were that close, but not this time. A full 9 days after she saw a fox for about 2 seconds, Baby Dog is still hopefully returning to that wonderful spot in anticipation of a repeat performance. I haven't heard the foxes barking this week at all, so I think her hopes of seeing them again so close to the cabin will not soon be fulfilled. I keep wondering how long she will continue to stare up at that spot in hope. Baby Dog has a long memory. And don't forget: this weekend is the Perseid meteor shower, one of the best free shows on the planet. Sunday night into Monday morning before dawn is supposed to be the best time, but yesterday www.spaceweather.com was already reporting a few meteors were spotted on Wednesday night. I expect late Saturday night to hold decent viewing (and that's likely the easier night for most people to do much viewing). This year has the added bonus of a nearly new moon, so nothing in the night sky will be competing with the shower for attention. So opens Henry David Thoreau's Walden. Just in case you've been too busy to remember (and who hasn't been? ), today is the 153rd anniversary of the publishing of Walden. In honor of that event, I would like to recommend two Web sites. 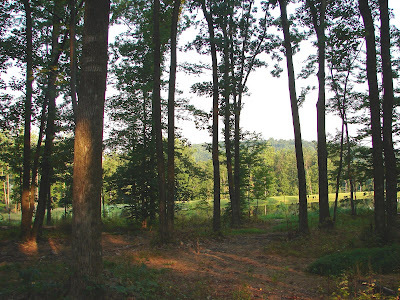 The first is a Thoreau site with an online annotated version of Walden so you can also read all sorts of interesting commentary and information to go with the book. At the main page of that site is a lot more Thoreau information, including pictures of the pond and area where Thoreau lived and wrote. The last site is Henry's blog. I'll bet you didn't know he had one, did you? Although you won't get "new" reports from Henry, the site has published his diaries, day by day, so that it looks like a blog. 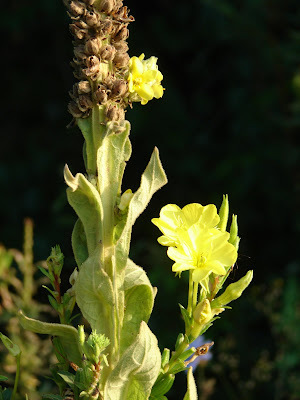 My photo this morning is of a blooming mullein plant with the sun on the blooms. Today the weather is improving, if not yet fuly improved. The dew point is a bit lower, as is the temperature. I already feel like walking again. This morning was one of the few times in a year where I didn't walk through the woods. A thunderstorm rumbled through around 3:30 this morning, ending my night's sleep. At 5:30 it was still rumbling, and I didn't want to get too far from the cabin in case the rumblings again turned more ominous. Dog was disappointed, as was I, but that's the way it goes. It's not often that I don't walk at least half a mile or so deeper into the woods in the mornings. When I don't, it's usually because of a weather event, occasionally an injury, more rarely an illness. Over the course of a year the total number of days that I don't walk in the woods are rarely more than half a dozen or so. I know the woods better than I know anything else, I think, though that really shouldn't be surprising considering how much time I spend in them. 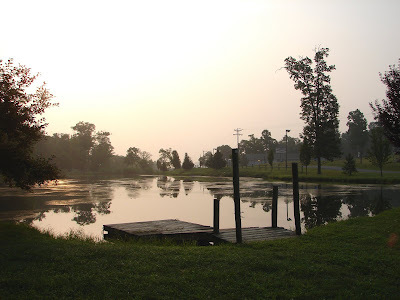 This morning, as Dog and I took a shortened walk around one of the snowmaking ponds, Dog spied one of the Roundtop employees getting an early start to the day's work before the heat of today turns really fierce. Well, you'd have thought he'd just seen an elephant. The man was still more than 100 yards away but Dog stood on his hind legs and wouldn't listen and danced around in excitement. I guess to him that a man in a 'Gator is more of a rarity than a deer or a fox. Gee, maybe we really should get out more. Hopefully, I'll get back into the woods tomorrow. I'm kind of looking forward to seeing what the weather and the season brings after this hot spell breaks. I suspect there will be some sense that the season is turning, at least a little bit, away from mid-summer and the year's hottest days. We'll see. It's going to be a hot one. In fact, if I'm lucky, today will be the hottest day of the year. Just make it through today, I tell myself, and it will downhill from here on. Just make it through today, and it will be another year before it is this hot again. In many ways, I feel that every day I have here on the mountain, every day of health, is a gift. But some days are more like gifts of diamond bracelets, while others are, perhaps, a sensible school blouse from an aunt. Today, falls into that latter category. I'm trying to see today as a gift, even if it's not a gift I particularly appreciate at the moment. Still, this morning, before the heat really kicked in, I took this photo of the early morning sun through the haze of humidity. It produced a natural sepia effect--no special camera action here. And I am glad I was around to see it. After a hot and humid weekend, a little rain finally came my way last evening. For a change, it wasn’t the kind of downpour that comes with thunderstorms. It was a nice gentle rain that lasted several hours and soaked into the ground. Yesterday, before the rain, the grass on Roundtop’s slopes was so dry that it crackled and crunched underneath my feet, and disintegrated into dust when I stepped on it—a weird sound and sensation. This morning, it is very foggy, and I needed my headlamp when I took Dog for his early morning walk in the forest.. It wasn’t until I reached an open area, where the trees didn’t bend so close, that I could turn it off. I need a headlamp for most of the year when I walk Dog, but for some reason the first day in August that I need it always comes as shock. My brain just can’t wrap itself around the idea that in mid-summer it’s already growing that dark again. Dog scared up several deer this morning. I don’t know how many as I never saw them. He got very excited, his nose in the air, as we walked along one of the old two-tracks, and I knew he was on to something. Then all of a sudden the underbrush about 20 feet away exploded with snorts and stamps and running hooves. It sounded like an army of deer but the underbrush was so thick, I never even saw their raised tails. I believe they were bedded down for the night in that area. We either walked close enough to startle them or were upwind enough for them to finally scent us, and they bolted. Dog was thrilled, but he likes that kind of drama. I prefer a more quiet start to my days, at least until I’ve had my first cup of coffee. I've seen far fewer swallows at Roundop this year than is typical, and I have wondered what was going on all summer long. I have a few barn swallows, but in most summers these birds fill the utility wires that run next to the snowmaking ponds. And in most summers it's not just barn swallows. Rough-legged swallows are usually fairly common, as are tree swallows. Not this year. This year I've seen only barn swallows and only a few of those. Now, I hear of a reason that might explain that. The latest issue of The Auk, the publication of the American Ornithologists' Untion, has an article that suggests many birds, and swallows especially, died during the late cold snap experienced this past spring in the east. The article suggests that the cold snap killed the insects these birds eat, and that the swallows died during their migration as a result. Naturally, this work is still a preliminary one, but at the very least it offers an avenue to explore this possibility more fully. I've already been told the local peach crop suffered a severe blow from that cold snap. The peaches available right now are excellent but the local orchardman tell me there aren't many of them and that they will disappear quickly from the local produce stands. In the I-knew-it-would-happen department: this morning Baby Dog wouldn't walk past the spot where she saw the fox yesterday. She kept expecting to see the fox again and planted her feet in one spot, on alert. Everytime I called her away or turned my back, she headed back there again as soon as she could. That girl has a memory like an elephant. I'll be lucky if she's forgotten this episode by this time next year. Today the weather is to be hot and steamy but this morning isn’t that at all. The temperature is comfortable and the humidity low. I’m noticing already how much darker it is at 5:30 than it used to be. It’s almost fully dark, at least to my sleepy eyes, though it quickly lightens up. By the time I pull on my shoes and grab Dog’s leash, the dark is already lifting. The light this morning was especially nice. 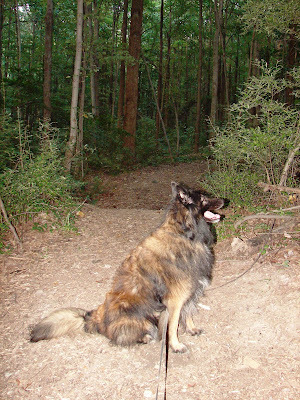 Dog and I walked along a short trail, winding into a woods that glowed with the golden shades of a summer morning. This was summer at its prettiest, and for a few moments that light and this glow made the season feel like the unending days of my childhood. 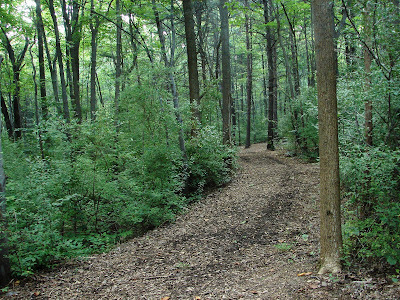 Walking in the woods, sometimes, is like a meditation. I never know what thoughts, feelings or memories will be stirred by the sights around me. They bubble up like water from a hidden spring to the surface, rippling out, before being absorbed, once again, into the calming water of a larger lake. Baby Dog spotted one of the foxes this morning. This shouldn’t have been a surprise, really. Last night the foxes were barking for some time, up above my cabin but not far away. Baby Dog spotted the fox in tall grass before I saw it. I thought she was staring at the spot where she saw a groundhog last week. Baby Dog never forgets where she sees animals and on every walk that nears a site of such an encounter, she pulls on the leash and tries to get back over there in hopes of seeing it again. So when she went to the end of the leash and froze at attention, at first I didn’t pay much attention to her. Then she started to bark. I looked up just as the fox moved, its motion making it visible to me. It disappeared back into the tall grass. It took a full minute for me to calm Baby Dog. I suspect we’re never going to be able to walk quietly past that spot again. I can almost hear you asking, "what is that?" This is a portion of my green box, east direction. My cabin is is simply a little brown box plopped into the middle of the forest. I am surrounded. In summer, as you can tell, I can't see the sky. For this photo I stood on my front porch and pointed the camera towards the tops of the trees to even see a few pinprick size holes of the sky. When I look straight out at eye level, I don't even see that. When I look to the south direction, I see even less sky. If I'm on my back deck and look to the north, it's about the same. To the west, I see no sky at all. If I stand on the back deck and look straight up, I do see a little sky, but only a little. In the winter, of course, it's a different story. I have great views, especially to the west. The south view is always blocked by the mountain itself, though I can see a good distance up the mountain. The eastern view in winter is the least interesting. 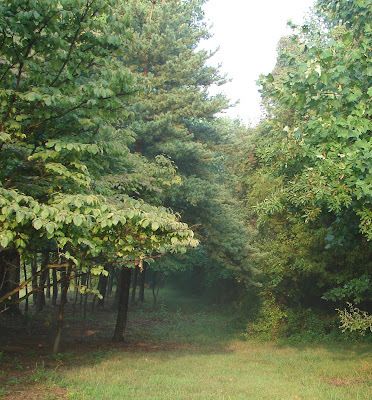 I can see to about the end of the driveway, but then the dense forest blocks further views. The view to the north isn't bad then, either, especially if I'm upstairs. So this is what I call my green box. It is one of the reasons why summer is my least favorite season. I simply can't see much, not even the sky. Here's hoping for an early autumn.